Recommended by author Marilyn Shannon! Make your own home-made yogurt cultures with this excellent electric maker product recommended by author Marilyn Shannon. Comes with a candy thermometer so that accurate temperature is achieved when using the Freeze-Dried Yogurt Starter to help ensure success. Offers natural, healthy and perfect yougurt every time, as a great alternative to store-bought yougurt. Extra Batch Jar is available if you and your family really like yogurt! Freeze-dried Starter comes in three textures: CBA (regular probiotic acidphilus), Fromage (cottage cheese and sour cream) and Kefir (buttermilk consistency called the "champagne of milk"). Yogurt starter requires an incubation period of 12 to 15 hours, during which time the temperature must be increased gradually from 23°C to 44°C (73°F to 112°F), The Yogourmet Multi yogurt maker meets this requirement with a heating system specially designed to heat in this pattern. An electric yogurt maker specially designed to maintain the ideal temperature required for preparing healthy, natural and perfect yogurt every time. With the Yogourmet Multi yogurt maker, you can make home-made yogurt with any kind of milk. You can also prepare delicious yogurt cheese and even casei bifidus acidophilus yogurt. The system is very economical, as you can prepare 1 or 2 litres at a time for about half the price of store-bought yogurt. Home-made yogurt keeps for over 3 weeks in the refrigerator. 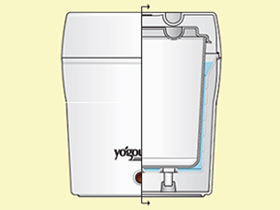 The Yogourmet Multi yogurt maker is protected by a 1 year factory warranty. A dishwasher-safe inner container with seal-tight lid, to keep your yogurt fresh. Inner containers can also be purchased separately, so that you can start another batch of yogurt while you finish your previous batch. A cotton bag, specially designed to make your own cheese. The bag has a large, easy-to-fill opening, and a practical cord, which makes it easy to close and hang. A 12 page instruction manual, so that you get the best results with your Yogourmet Multi system and enjoy excellent, healthy and nutritious yogurt.